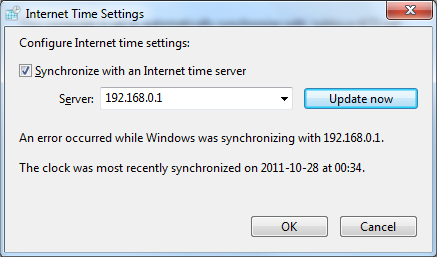 How to synchronize time between a Windows client and a Linux NTP server? I want my Windows 7 machine to get its time from my Linux Debian Sid server. "Unspecified error" doesn't help me much. Any idea what's going on here? Time servers take a couple of samples to make sure they are reading the upstream servers properly and to set their own stratum correctly. It sometimes takes a while. Usually less then 10 minutes. When you get an error like that you should first check the stratum your NTP server is reporting. There is a limit on how low windows will go to set its time from a NTP server, but I dont recall off the top of my head. Well, David Schwartz was right: by the time it took me to write my question, my NTP server got synchronized and Windows successfully updated its clock. Quite frankly, I had no idea I needed to actually wait for it. I thought it was instantaneous. You're good to go when OpenNTPD writes clock is now synced to the syslog, not before. Well, good to know. Not the answer you're looking for? Browse other questions tagged linux windows ntp ntpd or ask your own question. How does an NTP host switch among the various modes? How can I know which client is referring ntp server? How can I synchronize system time with a NTP server continuously?